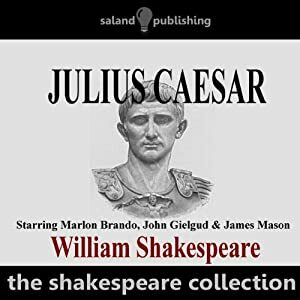 If anyone's interested, the third of the 'Julius Caesar' albums, 'Dramatic Hightlights' with Gielgud, Brando and Mason etc., narrated by John Houseman and once available on MGM, then Mfp, is now available as a CD or download from the 'Saland' label. It may not excite some filmscore collectors, the music is dialled down low, but it's one of the great Shakespearean albums of all time, and shouldn't be out of print. If you've the DVD, you probably won't see the need of it, but it's a fine classic album. And, it has more dialogue than what is in the film: Cassius' death speech for one, which, in the current edit of the film, is curtailed. Also, in an amazing detail, Bernard Herrmann was the one producer John Houseman and director Joseph C. Mankiewicz wanted originally to do the score, but MGM nixed that, and insisted on Rozsa. Herrmann, contrary to his curmudgeon reputation, was not only appreciative of Rozsa's work on JULIUS CAESAR, he included the first known recorded suite from the score in his London album, "Suites from Shakespearean Films." Having seen the film many years ago, and not particularly struck by Rozsa's score, 'Julius Caesar' was not a priority for me. However, having listened to the track samples on the CD on this site and being impressed by them, I decided to purchase the CD. . . . I have found the film on line and intend to watch it again with Rozsa's music fresh in my mind. When you do see it again, you will understand why you were unimpressed the first time. Large chunks of the score were discarded. The greatest loss was the moody, brooding underscoring of Brutus's nocturnal soliloquy, wherein he rationalizes the idea of assassination. It's interesting to note that Rozsa was not unduly distressed by this decision to cut his music. He later said that "when Shakespeare speaks, Rozsa should be silent." John Houseman seems to be one of the very few Hollywood producers that Rozsa respected. He also bowed to Houseman's critique of a scene in LUST FOR LIFE (Gaughin's arrival in Arles), rewriting the music to concentrate on the drama rather than the scenic atmosphere. In Steven Smith's Herrmann biography there's a long passage how Houseman and Mankiewicz wanted Herrmann, and not Rózsa ("We don't want a neo-Kodály sound on this picture"), how they even went to MGM music director Johnny Green to persuade him, and how he tried to loan out Rózsa so the budget would accommodate a non-staff composer - but failed. "Don't tell me Rózsa isn't going to deliver a good score. Will it be different from Herrmann? Sure. Will it be less effective? I doubt it. It'll be effective in a Rózsa way. You want the Herrmann way, but MGM can't afford it", Green told them. In the event, Rózsa somewhat modified his style to please the producer and director, and the result was a very fine score that even Houseman would admit was effective. One of my favorites of Rozsa's glorious work! To me the trouble with being a Rozsa fan is that it's hard to settle on just two or three favourites. The man's output was of such consistent quality he seems only to have been limited by the opportunities each film provided. You never seem to tune in on a Rozsa score to find him note spinning or waffling, even under dialogue in the most uninspired films (check out the dialogue scoring in Sodom & Gomorrah for an example). As we know he had this ethic that, since film music was the only 'symphonic' music most people were likely to hear, any music of his should be of the highest quality, and within the imposed time limits it's hard to imagine even a Wagner could have done much better. And yet, like any truly great artist, he never considered excellent quite good enough, even to the point of once admitting to being ashamed of more than half his scores. This week I checked out two Rozsa concert works on Youtube: the piano and viola concertos. I've never felt Rozsa's concert work to have quite the impact and variety (stylistically and thematically) of his film scores (maybe the formalism of an abstract work restricted his imagination a little), but I couldn't help but be struck by the brilliance of even the viola concerto, which I hadn't warmed to previously. No, there isn't the profusion of themes we associate with Rozsa, and the work is certainly more 'ethnic' than any film score. Nevertheless the brilliance of the composer shines through so clearly one can only wonder why Rozsa is a name still largely unknown to regular concert goers. And as for the Piano Concerto, as I noted on the Youtube site, what a powerhouse work! Wow! Were there many more impressive, more exciting piano concertos written in the 20th Century? If so I'd be interested to hear them. Anyway, not sure what I'm rambling about--nothing to do with Julius Caesar here. I only own the Broughton version anyway. It works so brilliantly on different levels. An amazing boost to the drama in the film and an endless source of orchestral meditation. Also astounding that it is at least as good as what genius Bernard Herrmann might have created. Beware the Ides of March (look it up, Millennials). While you're doing all that bewaring, do it while listening to this magnificent score. Soothsayer: Aye, Caesar. But not gone.